Beyond that, Ballinger also told me that he would be climbing with bottled oxygen this year. The past two seasons he concentrated on getting a no-O's summit of Everest, making that dream a reality in 2017. But, he says that he didn't enjoy those climbs and remembers very little of the expeditions on the top third of the mountain. This year, it will be like discovering the route all over again. In the interview, he also shares his thoughts on low cost operators, the evolving environment on Everest, and much, much more. It is definitely worth a read and you can check it out here. Ballinger isn't the only one going for two summits this season, as two other squads are looking to complete an Everest-Lhotse traverse. 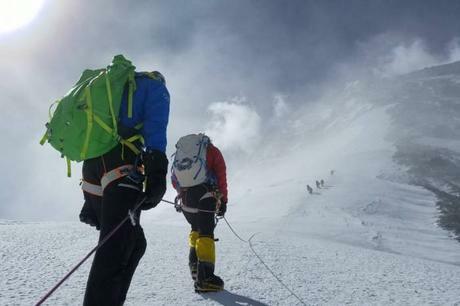 The first of those will be attempted by Tenjing Sherpa, who wants to complete that expedition in memory of his climbing partner Ueli Steck, who perished in the Himalaya while preparing for that climb last year. The duo of Horia Colibasanu and Peter Hamor are also looking to make the same climb. Meanwhile, Willie Benegas and Matt Moniz will also attempt an Everest-Lhotse double-summit, but not the traverse. There will be plenty of other good stories to follow in the days ahead, including some interesting climbs taking place on other peaks throughout the region. For now though, most of the teams are just finding their place and haven't even truly begun their expeditions yet. Stay tuned for more updates in the days ahead.